This is the only issue of the storyline I own, so any questions we have or what happens next, is beyond me. So this is the series where Colossus and Domino first meet. There is no sexual tension that I can see. That must come later in Cable and X-Force. Previously, the team has been chasing monsters across the globe. Once they confront one of the monsters, they die. Colossus punched one in the head and Domino shot another one. Storm hasn’t been informing Cyclops about anything that is going on with the team. This has been annoying Colossus. Storm is concern with what Cyclops will do with the information. Storm got a human researcher involved. The monsters are really proto-mutants. In Quebec City, a giant proto-mutant has been located. With each step, he grows! Quebec City, Canada. Storm has created a giant thunderstorm so people stay in their homes. The news reports that it is an isolated storm. Which is odd, as by now, with how long Storm has been around – wouldn’t people just assume Storm is the reason for any odd or freak weather conditions? Is that racist? We get two pages of how Storm is maintaining no one being outside. Then Psylocke sees the giant man. Turn the page, the man is human sized and wearing an X-Men shirt (do they just keep a hundred on board the X-Jet?) and surrounded by the rest of the X-Men. That is resolving the problem post haste! Which, and I’ve notice this about myself with television shows and movies, I don’t really need to see or hear certain conversations or see a big fight scene. If the next scene is a quick recap of what happened, I’m okay with getting to the events that matter. Psylocke is on Storm’s side that they should know all of the information before involving Cyclops. X-Jet, over the mid-Atlantic. Colossus admits that he isn’t very good at medical duties, he only has field training. Which harkens me back to the good ol’ days when Nightcrawler was the resident healer. Maybe Colossus picked up a thing or two from Kurt. The X-Jet is pretty large as they have a room for the proto-mutant and an office for Storm to sit. She tells Pixie to speak and keep the stranger calm. Colossus and Storm go to her office. Now this scene, would probably benefits the longer readers but I get the jist of it. Colossus really wants to inform Cyclops with what is happening. Storm doesn’t and she is being super vague about her reasons. Which doesn’t really help the tension between the two. What really doesn’t help? That Storm threatens to have Pixie teleport Colossus over 500 feet above Utopia. Which seems highly unnecessary. I really like the visual of the massive Colossus standing tall and with his arms crossed and Storm sitting in her chair, he’s trying to physically intimidate her but she’s Storm and isn’t even bothered by him as he’s Colossus – the worst X-Man. Before Colossus can respond to that horrible threat (did Storm really just say that?) that research student, Ms. Hunter, is called via Storm’s computer. Hunter reveals that their camp site was ruined and their hard drives were stolen. Storm asks where Hunter is and she tells her she is in an Internet cafe. This sends Colossus into a rage and he can’t believe she is calling them from an unsecured site. As if the X-Men couldn’t defend themselves. But I guess it is nice that Colossus knows enough about the modern world, to be worried about someone tracing them. Though they are in a plane, so I imagine that tracking them wouldn’t be that easy. Once that call is over, Colossus tells Storm that if she threatens him again, that he will be a bigger problem to Storm than whatever she thinks Cyclops will do. Why does Storm want to keep Colossus on the team? To smash stuff? Psylocke can do that and Pixie can teleport them beyond any walls. He really isn’t necessary at all, except that he is the sole male on the team, thus, he is holding the team back. Domino can destroy walls as well. Maybe Cyclops made Storm keep Colossus on the team and she was able to choose anyone else? Pixie enters the room, informs the two of them that the proto-mutant only speaks Russian. I guess Xavier quit inserting languages into students’ heads prior to her joining the school. Probably something to do about students at a school and learning, or some silly thing like that. Colossus is thrilled to hear the guy speaks Russian but wants his sister to be brought to the plane. The man speaks an old fashion dialect of Russian, it is very rural. For some reason, Illyana should be able to decipher it? Maybe because she spent more time in Russia than he did? He’s been too Americanized? Or he wasn’t very smart at learning? There are many reasons. I wonder, once Magik gets there, if Storm wondered if she could swap the Rasputin siblings. Though then she wouldn’t need Pixie around as much. Except to teleport at greater distances. Pixie still isn’t comfortable around Magik, as she hesitates before retrieving her. Magik took a piece of her soul (hence why she can do magic now) but did give it back. But it was a pretty traumatic experience. 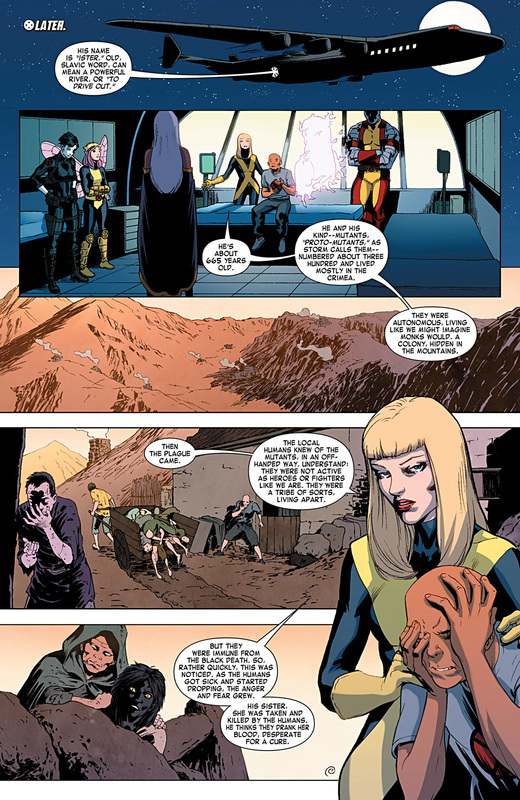 Magik has been able to speak to the proto-mutant, whose name is Ister. He is roughly 665 years old. He is most likely 666 years old but doesn’t want to be viewed as relating to the devil. Thanks to YouTuber Soheil Koushan for hosting the video! Such a great song! It is one of the songs my wife knows every word of so she sings it a bit around the house. Pixie wonders how Ister has all of these memories. Colossus is somehow the brains of the team, and he explains that it must be Ister’s power. These poor proto-mutants are victims of genocide. 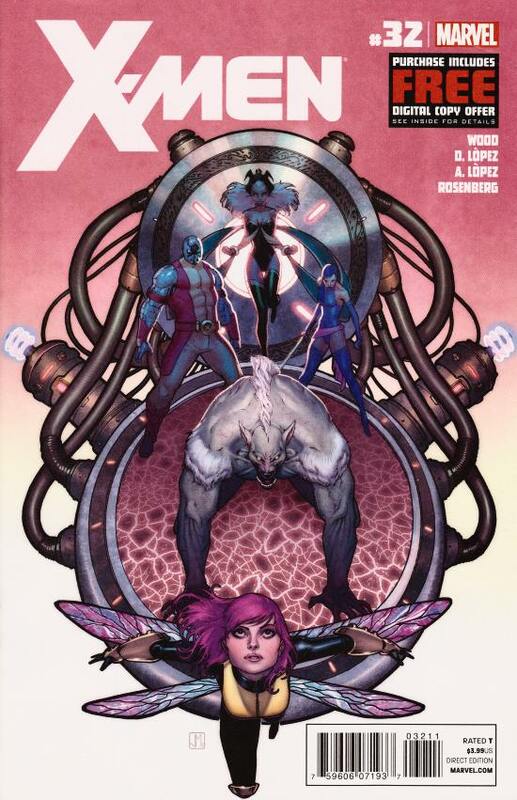 In a nice artist choice, Psylocke is present via her telepathic powers. Thanks to my pal from over at the X-Books forum, MarvelMaster616, and his great blog – for having the Magik pages! That was pretty handy! I like how quickly Magik comes to the instant conclusion that they have to call Cyclops and figure out how to save the proto-mutants. Storm doesn’t want to do that, just yet. In an odd choice, Magik has the idea that she should go back in time and save them. Storm doesn’t want that as it could change the present too much. It is odd because why Magik doesn’t always have this plan. Especially now that she has a better grasp of her powers. Also, nice to see Magik in her New Mutants uniform. Makes me appreciate her current uniform more. She wore that uniform far too long. Just like her dear friend, Kitty. Colossus told his sister earlier about the conflict between Storm and Cyclops. In the cockpit, Psylocke and Storm talk. Psylocke is concern about the tension of the team. Storm relieves Psylocke so she can get some rest. Storm wonders about where Ister came from. Just then, she gets a vision of the mad scientist who is experimenting on the proto-mutants. Of course, he is harassing Ister’s sister. He tells her that he is about to kill her brother. Storm wakes from the horrible vision. There is an ad for New Mutants Volume Three issues 47 and 48, the covers combine to make a larger image. I own issue 47. 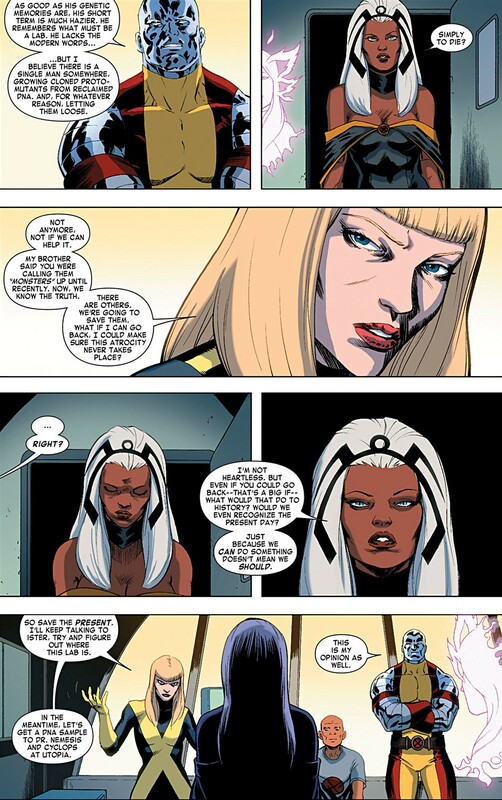 Colossus tells Storm that Pixie has returned Magik to Utopia. Magik isn’t afraid of Storm, why would she be?, so she will probably tell Cyclops what is up. Psylocke also had a vision. Pixie has Cyclops on the phone, Storm tells her to take a message. Ister’s head starts losing blood from every orifice. He is dying. Storm tells Psylocke to download his memories, something I’m surprised doesn’t happen more often. Ister sadly dies but Psylocke was successful. She also knows the scientist’s name and location. David Michael Gray is his name. As I have never heard of him nor the proto-mutants, I imagine they all die and the X-Men fail but learn an important lession. Or Gray dies and the proto-mutants find a small piece of land to claim as their own, that isn’t on Utopia.